Ricky Gervais presents an award at the 66th Primetime Emmy Awards in Los Angeles on Monday, Aug. 25, 2014, in Los Angeles. Comedian Ricky Gervais is set to host the Golden Globes once again this January, NBC and the Hollywood Foreign Press Association announced on Monday. The Golden Globe-winning humorist and film star, who rose to fame with the original version of "The Office," hosted the Globes between 2010 and 2012, making this his fourth stint as emcee. The awards show is being held at the Beverly Hilton Hotel on January 10, 2016, and aired on NBC. "We're excited to have Ricky Gervais back to host the most enjoyable awards show of the season in his own inimitable way," NBC Entertainment Chairman Robert Greenblatt said in a statement. "Disarming and surprising, Ricky is ready to honor -- and send up -- the best work of the year in film and television." 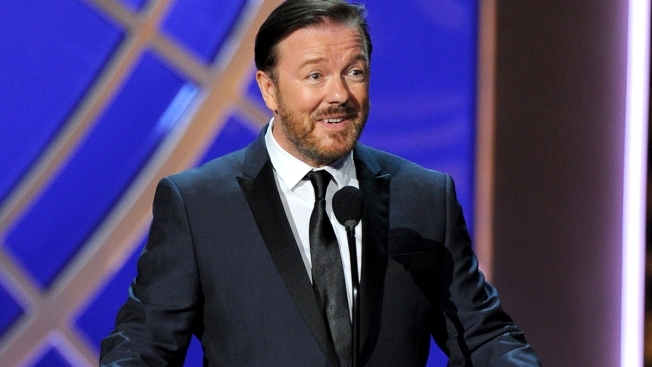 Gervais is currently starring in Netflix's "Derek," which he created. He also had a series of projects on HBO, including the series "Extras." "Ricky Gervais left us with a lasting impression and we are thrilled to have him back in our show as we honor the best in film and television," said Lorenzo Soria, President of the Hollywood Foreign Press Association.